Baking brings smiles for kids that love baked goods (cookies and pies and cakes!) and that is why the Kidstir “Bake Me Happy” kit is a favorite. 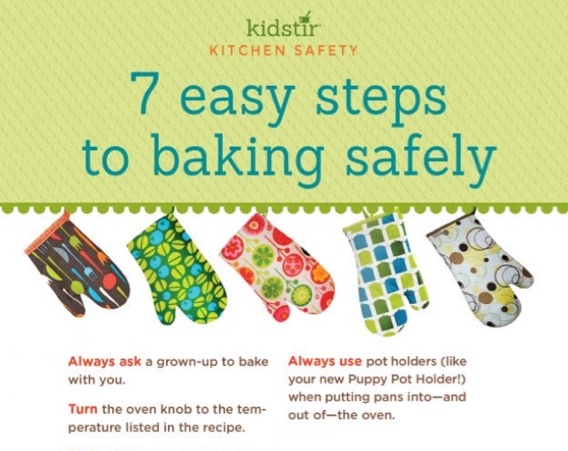 Here are some tips to make baking safer. Always ask a grown-up to bake with you. Turn the oven knob to the temperature listed in the recipe. Preheat the oven for 15 minutes so it’s nice and hot. Otherwise, your food will take longer to bake, or cook evenly. Don’t open the oven door t check your food until it is almost done. The temperature drops every time the door opens. Always use pot holders (like your new Puppy Pot Holder!) when putting pans into – and out of – the oven. When the timer goes off, a grown-up can help take the food out of the hot oven. Remember to switch off the oven when you are done baking. Once you’ve baked up all those goodies, you may want a few good bake sale ideas. Then you’ll need to print up a sign for your bake sale. We’d love to offer Kids our “How to Dice an Avocado” infographic for you to share on your blog. Just select and copy the code snippet below and paste into your next blog post. We’d love for everyone to share this page on social media or email by using the buttons below to share our Safe Baking for Kids Infographic!